The late Paul S. Honda, a distinguished member of PAAC’s Senior Advisory Council, established an endowment for this scholarship fund to promote Asian Studies and International Studies in higher education. Every academic year, four $1,000 scholarships are given in his name to graduating seniors who have demonstrated leadership in international affairs and plan to pursue degrees in Asian Studies, International Affairs or a related field. The legacy of Eddie Tangen, a pioneer in the development of Hawaiʻi’s labor movement and past member of PAAC’s Board of Governors, is honored with a $300 award given yearly in his name to one PAAC student in grades 9-11. Online application and teacher recommendation(s) must be received by April 3, 2019. For more information, contact Jason Shon at hs@paachawaii.org or (808) 944-7759. PAAC clubs represent the traditional form of PAAC’s outreach into high schools. Many clubs are student-initiated and driven. The overall goal is to increase club members’ awareness of international affairs. Clubs participate in PAAC-sponsored events such as inter-school conferences and competitions, and tailor the program to meet the needs of their school. 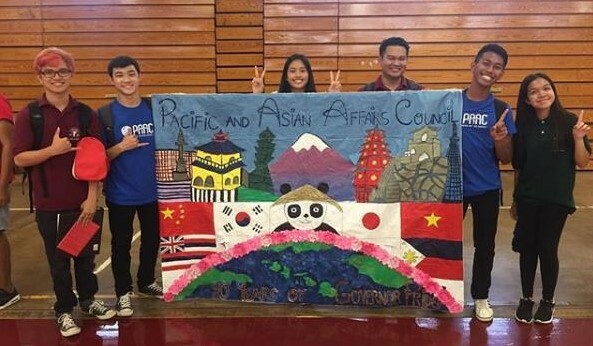 If you are interested in having a PAAC club at your high school, contact us at hs@paachawaii.org or (808) 944-7759. PAAC has established a PAAC Club Fund to support clubs to 1) undertake Global Action Projects that make a positive impact on the local community; 2) learn about international affairs, other countries and cultures, and global issues; and 3) increase club membership and participation. Requests for funding are limited to $500 unless a larger sum can be justified. Requests must be submitted before the proposed activity/project takes place and require PAAC’s approval before funding is granted. Download the PAAC Club Fund Request Form and Example Proposal and Report here. PAAC and the Hawaiʻi Institute for Human Rights are hosting a Club Challenge to redesign the UN Sustainable Development Goal symbols to Hawaiʻi themed symbols. Winning designs will be showcased on PAAC's website and displayed at PAAC's 2018 Fall Global Vision Summit. Submit your designs by April 15, 2019. Download Contest Details and Instructions here. PAAC challenges its clubs to distinguish themselves by setting goals relating to participation, community impact, and reporting. Clubs that reach any one of the three tiers will receive awards and be recognized at PAAC’s annual reception in April 2019. This is not a ranking of the “best” clubs; rather, we hope clubs will work together in a spirit of friendly competition and collaboration to reach their club goals. Download Details and Instructions here. Want to learn more about food security? North/South Korean relations? Power Women in Singapore? Invite a guest speaker to your club meeting! PAAC can connect you with professionals in diverse fields who are willing to come to your school to share their knowledge and experience. Contact Jason Shon at hs@paachawaii.org for more information.